Vitamin C has many benefits for the skin, from evening out skin tone to protecting against pollution but for me, the main benefit is that it brightens my skin and banishes any signs of dullness, which my dry skin is prone to. Brighter skin also looks more youthful so Vitamin C is something that all skin types can benefit from. I personally don't use Vitamin C products on a daily basis but I have three in my collection that I reach for when my skin is looking particularly dull and I want to share my thoughts on them with you today! Clinique Fresh Pressed Renewing powder with pure Vitamin C: Vitamin C isn't always stable so to ensure that its fresh, this product is individually packaged. I open the packet, wet my hands, dispense the powder into my hands and mix to create a paste before massaging into my face and neck. I then leave it for a minute to work before rinsing. Unlike other powder cleansers that I have tried, this isn't drying on the skin - my skin feels soft and comfortable and instantly looks brighter and more radiant. A 28 day supply is priced at £24. Debenhams UK/Ireland. House Of Fraser. Sunday Riley CEO Rapid Flash Brightening Serum: I have tried a few Vitamin C serums but none as effective as this one from Sunday Riley. It was love at first sniff with this serum as it smells like zesty oranges. It has a creamy-lotion texture that absorbs quickly into the skin. What makes this serum different from other Vitamin C serums that I have tried is that it contains 15% THD Ascorbate, which only converts to L-Ascorbic Acid once it comes into contact with the skin so it is much more stable than other similar products. As a result, it delivers instant and powerful results - skin looks even and with a radiance that usually only facials achieve. Over time, skin texture improves and skin also feels firmer. As with all Sunday Riley skincare, this is expensive but worth the price. £70 for 30ml from Space NK. 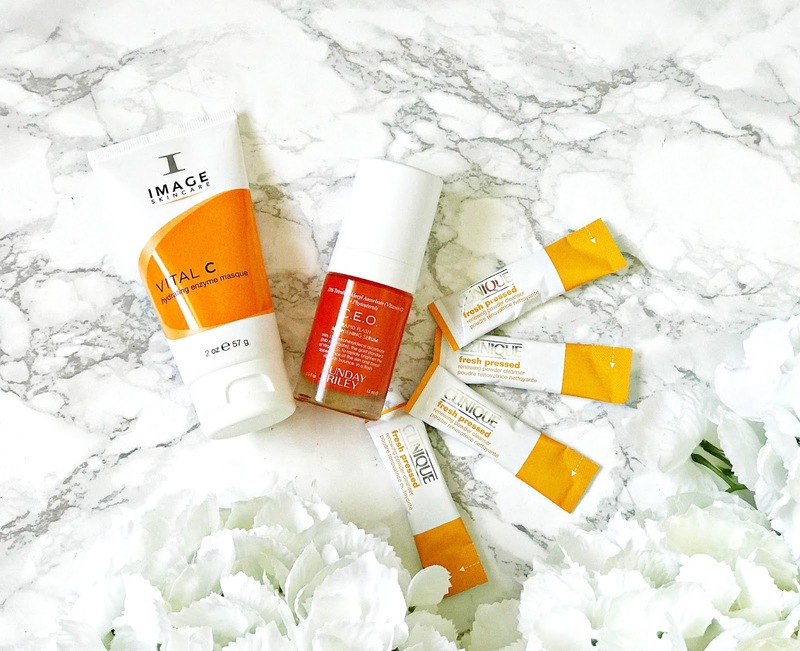 Image Vital C Enzyme Mask: If you think your skin is too sensitive to use Vitamin C products on a daily basis, then a good option is this Image mask, which can be used once weekly. The instructions say that this mask can be used for up to 30 minutes but I find that 10-15 minutes max is ample for my skin. As well as Vitamin C, it contains Vitamins A and E so the result is refined, smooth, soft and bright skin. This mask is ideal to use before a special event as it really preps the skin well for makeup. €42. Is Vitamin C a regular part of your skincare routine? What's your favourite product? I'd love to hear!